Since Sunday, March 26th, the National Hurricane Center has been closely monitoring the first Invest 90-L, which is sitting east of the Bahamas, for its potential to develop into a subtropical storm. 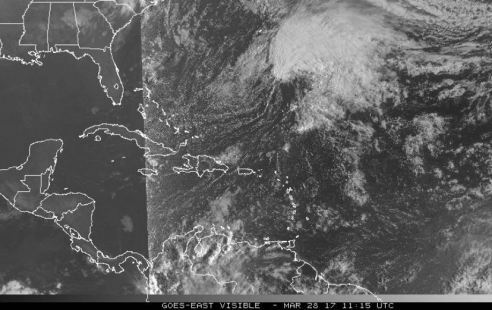 Although the Atlantic hurricane season does not officially begin until June 1st, meteorologists are wondering if the season will get an early head start. The forecast charts indicated that Invest-90L is a low pressure system that has no threat to landmass. However, if this system does become organized to earn a subtropical or tropical storm status, it would take the first name in the 2017 list; Arlene. Other tropical storm names are: Bret, Cindy, Don, Emily, Franklin, Gert, Harvey, Irene, Jose, Katia, Lee, Maria, Nate, Ophelia, Philippe, Rina, Sean, Tammy, Vince, and Whitney. According to the National Oceanic and Atmospheric Administration (NOAA), tropical storms are rare during the month of March. The last storm documented in this month was over 100 years ago on March 6, 1908. In August 2016, Belize was struck by Hurricane Earl. It left a path of destruction, with the category 1 hurricane wiping out entire docks and even buildings on Ambergris Caye. In other parts of Belize, trees were uprooted, power lines fell, rooftops blew away and several homes in the low lying areas were completely flooded or destroyed. The country of Belize suffered a huge economic loss, and continues to recover. The National Emergency Management Organization (NEMO) of Belize highly recommends all households to be prepared. Items suggested for a hurricane kite include: a battery operated radio, flashlights, extra batteries, a non-electric can opener, matches, canned or non-perishable foods and drinks, extra prescription medication, baby food, diapers and formula, first-aid kit, portable cooler, potable water, eating utensils, toiletries, emergency cooking accessories, battery-operated lantern, and a fire extinguisher.